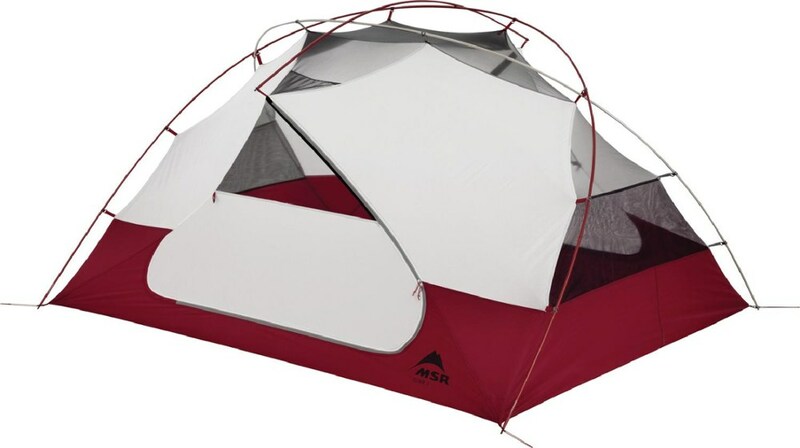 The Alps Mountaineering Chaos 3 tent deserves a serious look. I've owned numerous tents over the past three decades of camping, all from big name outdoor companies. With the recent delamination of the sealed seams on my current 15-year-old tent and all four kids are grown and gone, I began to research specs, pricing and reviews of reasonably priced tents that would fit my pursuits as a backpacker/paddler/bikepacker/carcamper...along with my budget. After months of reading, I pulled the trigger and purchased the Alps Mountaineering Chaos 3 (http://www.alpsmountaineering.com/products/tents/backpacking-tents/chaos)...and model specific footprint this spring, knowing I'd be camping at least 35 days in 8 different states facing a wide range of conditions. While clearly not an exhaustive review, I have my thoughts...which I will share here. 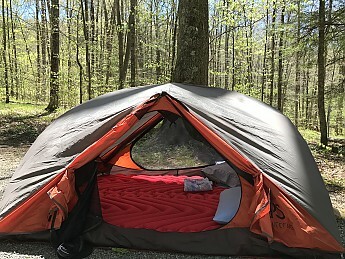 If you just want to look at the pictures and don't want to read any further...the bottomline..I do believe the Alps Mountaineering Chaos 3, overall, is a pretty solid tent worth considering. Straight out of the box, tent materials appeared and felt stout and durable. Stitching was even (a pet peeve of mine). Should you have need of them, setup instructions are permanently sewn into the inside lip of the stuff sack. Setup is simple, straightforward and quick. The Chaos 3 packs small enough and light enough (5 lbs.) for backpacking. 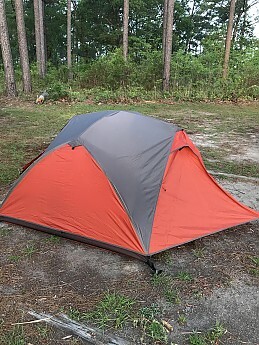 I am not an ultra-lite type of hiker, but the Chaos 3 is four pounds lighter than my 35-year-old NF VE-24 that I've packed for decades, thus qualifying it as a notable backpacking tent in my book. The Chaos 3 has one modular pole with two at opposing ends that splay out four poles toward the four corners...and a separate shorter brow or awning pole. All pole ferrule ends "lock" firmly into the grommets of both the tent and footprint. Plastic clips sewn into the outside of the tent make for rapid attachment of the tent body to the poles. More interior mesh storage pockets are at both ends of the tent body. I found them stout enough not to sag even under weighty items. 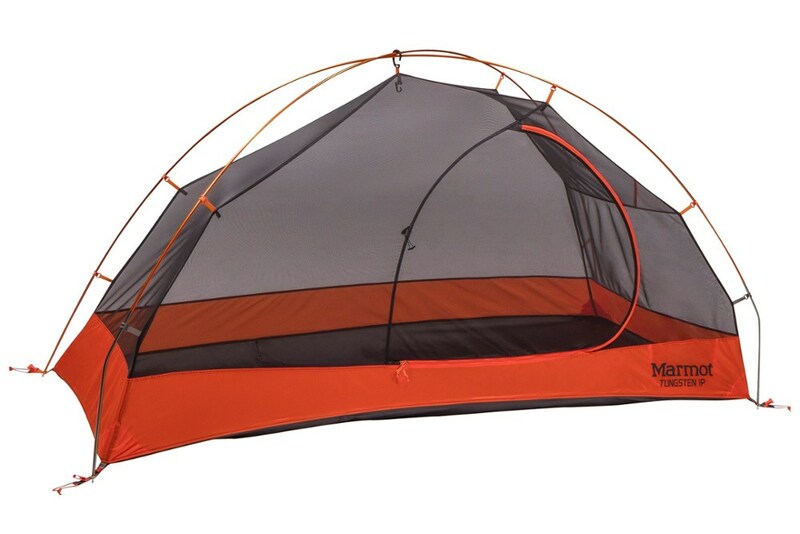 An included, detachable mesh loft attaches with four plastic hooks to web tabs on the interior tent roof. The rainfly is full coverage, with vestibules at both doorways. 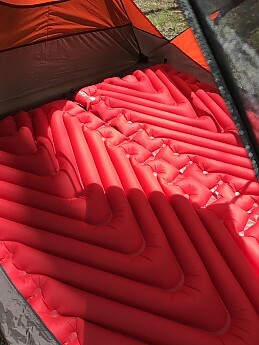 Double guyouts on the each end, one top, one bottom help provide added stability in winds and also aid with air circulation. On the left side of each vestibule there is a nice-size vent with folddown kickstand to assist with airflow. More important, with the incorporation of the brow pole, the vestibule zipper is never over the tent body. So even if water penetrated the zipper, it would not drip into the tent. As with so many of today's three-season tents you have no privacy without the rainfly. Vestibule can be rolled back and tied, allowing things to get aired out. You will have to reach and crawl to get out of the vestibule. A standard in today's tents...you can forego the tent body and fastpitch the rainfly with the model specific footprint. The rainfly has interior hook-n-loop fasteners to attach to the poles for added stability and minimize flapping/sliding. Where I camped, it wasn't an option for me...spiders and ants were of apocalyptic proportion. Will the vestibules fit a backpack? The short answer is Yes. Long answer...a 55 L pack will have to lean against the tent body...and the body will get some rain splash. The Chaos 3 incorporates the bathtub style floor, offering reliable watertightness. The tent body floor is rectangular and is listed at 90"x66," but with the tent staked out tightly, two Klymit Insulated Static V pads at 30" wide consumed all tent real estate side to side. My best guess is this tent is a super friendly three-person with narrow sleeping pads, toes to nose. At 6/180 my head hit the roof netting sitting straight up in the center. 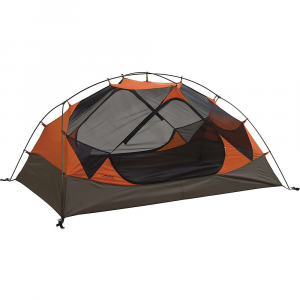 The model specific footprint is made of the same material and thick waterproof coating as the tent floor with nylon bound edges for longer life. Webbing at the four corners and grommets are identical to that of the tent body. Fit was exact and it works well. The footprint is an option and well worth the price. 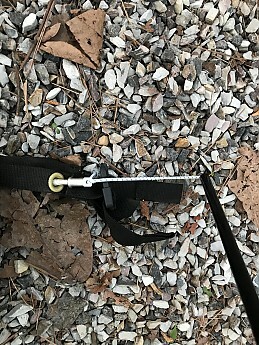 Included are the typical "shepherd's hook" style tent pegs that work well enough and reflective guylines to assist you in finding your tent after that 2 a.m. treasure chest visit, without you doing a faceplant over those guylines. Here's what I, personally, did not like in the Alps Mountaineering Chaos 3. 1) Heavy condensation on interior fly when temperatures were below 60 degrees. 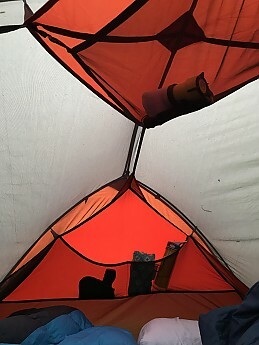 So heavy, it would collect on the main spine pole and brow pole, travel down the pole to the hub and drip into the tent...usually directly on my forehead or feet. Exiting the tent, if you brushed along the vestibule door...your shirt was saturated. Above 60 degrees, it did not appear to be an issue. Being primarily a shoulder season camper, this is a daily occurrence. The positive...in sunshine, it rainfly interior dries quickly. 2) Pole ferrule caps would pull out of the tent pole, still stuck in the tent grommet. 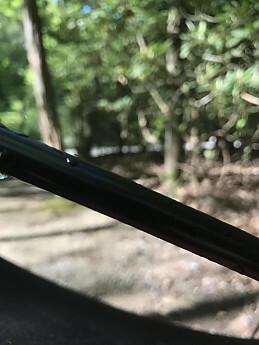 It was a common occurrence and irritation to feed the shockcording, knot and ferrule base back into the pole end, especially in driving rain. The positive...the pole ferrule cap/grommet connection is super secure...wind will not separate pole from tent body. 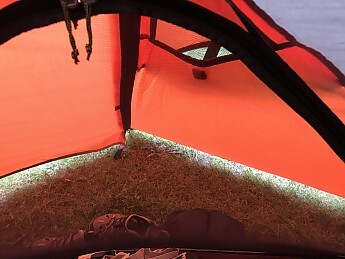 3) It's narrower than expected, as mentioned previously and does not provide enough space to bring gear inside...but that is purely preference and does not effect the soundness of this tent. 4) I did not like how low the netting went. It did what it is intended to do...airflow...but when it's freezing or below, just to have nylon covering halfway up the door would have been appreciated. Now here is what I liked about the Chaos 3. 1) Set up and properly staked and guyed out, it's bombproof, watertight, and flapfree. No rain water, or puddled water made its way into the tent interior. That's saying something with the horizontal freezing rain we experienced. 2) Setup is ridiculously easy and fast, and I did like the option to fastpitch it and then set up my tent body out of the rain...took some body English...but can be done. 3) It is pretty light, when you consider how robust the tent materials are. At this point, I'll equate that with durability too. 4) Simple...but I liked the color. Can I live with the Alps Mountaineering Chaos 3? Yes. Thanks for your complete review. Great tent over the years. Made Strong. Fits tall hikers and campers 6'4" easily makes a fit comfortably. Highly stable and fabulous. I LOVE this tent. I went on the hunt for tents this year to replace cheaper tents I had been using from garage sales. There are things I absolutely HAD to have in my new tent. The tent had to have vestibules for gear. Two doorways, no tripping over others. Size to fit two adults and one kiddo easily. Gear lofts to put my glasses and such into when I am sleeping. More than anything it had to have wind durability. Last year I was dip netting on the Kenai River in Alaska. I watched as tent after tent went rolling away with the super high winds (60mph) coming in. I walked the beach as people were chasing tents and gear across the sand dunes. I noted the brands left standing through it all. Kelty, REI, ALPS, and Sierra Designs. I bought this tent recently and took it on a road, hiking, and camping trip along the ALCAN highway and on the Alaska Ferry. In inclement weather you can duct tape the tent to the deck of the ship and camp out in a dry space. We had some pretty good winds and with the tent all fastened down with it's guide wires we did just fine inside. My daughter is 6'2" and could lay with head room to spare on the floor. I am no shrinking violet in size and we could fit with two adults and one 9-year-old. The tent had loads of nice gear storage pockets.For my book, glasses, keys, jewelry. While in the Yukon of Canada I was overjoyed to get away from the birds (mosquitoes) dive bombing us. I was glad to find that getting in and out f the tent was easy while swatting the bugs away. No tripping over edges, fumbling with zippers opening and closing on the wrong side. CONS: In the morning we had condensation on the inside of the tent fly. Overnight temps were around 28 degrees. I had one vent open but did not stake out the tent at the two ends. The next night I made sure to open up the fly vents and stake out at least two ends. The condensation was only at the end of the tent where all of out heads were. In the humidity and cold I am not all that surprised. Still, halfway through the night we had the same problem, though less. I ended up opening up one of the vestibule doors to get enough ventilation. I have yet to take it down to the wicked shore weather of the Kenai, but will give it, it's trial by fire there. All in all. Like the tent. It fit tight with no crackle (REI 4man) or wiggles (Coleman) in the winds we did have. Overall the cost was great for what we got. August 2013 ETA: So now it is two years later and I can give a little more about this tent. We have used it in all kinds of conditions. This last spring in Alaska we took it on a Scout campout. The first night we got hit with freezing rain that then turned to snow. The tent was under 15 lbs of ice easily. It took on sustained winds of 60mph. Make sure to batten down all the ties for this maneuver. We used the vestibules to keep extra gear. Two of them were VERY handy to keep things dry. Still we had no wicking of water no leaks. In colder weather no condensation on the inside. When the gust got to 80mph we had one of the few tents not collapsing. However, after all was said and done we did find that the poles that were in the leading edge of the weather got bent. There is no way I will ever be able to straighten them myself. I have yet to contact ALPS. With the conditions as they were the boys in our tent were some of the only kids kept dry. Next came a trip to the KENAI river mouth and coast. Again 60mph winds and it didn't budge stability was rock solid. Tenting in 80+ and it got warm inside for two adults. But at 80 I wasn't surprised. Open a side for ventilation and watch the night sky. My daughter now is 6'4" and easily fits into the tent. She can lay fully stretched and be comfortable. The tent is holding up over much use. Kids and teenagers. It isn't babied at all and is still in great condition. I have not done a water proofing re-coat as yet. Seams are still factory original. We probably us the tent 20x throughout the seasons. Rain, Sleet, Wind, Sand, Snow...still going strong. Happily upgrading my stars on this one. I've been needing a replacement for my 12+ yr old Sierra Designs Alpha tent. It has served me well but it's starting to deteriorate from 300+ days in the sun, rain, sleet, and Mt Washington wind. Plus it pushes 9 lbs. 2 is keep the bugs and snakes off of me. Beyond those needs I have some other features I would like to see taking into consideration weight and cost. I'm a firm believer that 3 means 2 when talking about capacity of a tent. The only way a 2 person is comfortable for 2 people is when the weather is so good you don't need a tent. Stuck in the rain for a couple days and that damn tent is unbearable. That being said I need a 3 person tent. I like a tent with 2 doors so nobody needs to get crawled over in the night. Finally if I can find all that less than 6 lbs. I'm doing alright. Now is where the money comes into play. I initially researched tents from MHW, Marmot, TNF, or SD tent. They all offered in one form or another a tent that was eligible but none were exceptional for the cost. One company caught my eye with their Chaos 3 tent was ALPS. New to me. I was skeptical but was impressed with the features and cost of the tent and decided to check one out. For $131 delivered I got a 41 sq ft double door with vestis at 5 lbs 15 oz. Inside the box was a brown sack containing the tent, fly, poles and a small pouch with 8 nice aluminum stakes 4 guy lines and a repair kit. Minus the sacks 2 stakes and 2 guy lines the weight comes to 5 lbs 13 oz. I set the tent up in my living room without instructions in less than 2 minutes. The tent was very spacious. Four people could sit Indian style and play cribbage in this tent comfortably it is similar in design to a hubba hubba. Straight walls gear loft and 4 nice sized stash pockets two which you could stuff the mesh doors into. I could see the cost reflected in the craftsmanship. The stitching isn't the straightest nor the panels perfect. Still though only a problem when your looking under a microscope all in all I was not disappointed. Until I put the fly on. The fly buckles to the tent and my fly was missing a buckle the webbing was intact though. An easy fix just cord on another buckle. I called ALPS to see if they would send me the buckle. They did. Attached to a whole new fly! Never had a company stand behind their gear like that before. Simply amazing. So far so good. But does the tent perform? Still having snow in my yard I didn't want to set it up outside yet plus I still didn't have a ground cloth. The nice thing about this tent is it's 7'6" x 5'6" so a 5 x 7 tarp is just the right size. $2.50 and 4 pieces of shockcord and I have a perfect footprint. The sun is out the snow is gone I can go outside and play. It has been raining here in Vermont for 10 days straight and I have had this Chaos 3 tent set up loaded with gear for half if them. It is very dry inside the fly has vents you can open and close to keep down condensation. It does need guying on its short ends as it us a little susceptible on very windy days due to it's weight saving one pole design. Longevity is really the only test this tent has yet to pass. Craftsmanship a bit lacking doesn't compromise the integrity of this tent one bit. This tent gets 5 stars for value and 4 stars for initial quality. Very happy with this tent. I will review it this fall on how it is holding up. I took the Alps Mountaineering Chaos 3 to Isle Royale in July for 8 days. It was purchased just for this trip. It was easy to set up and had plenty of room for two people. It was a little heavy for backpacking, but if you split it up between two people it was OK.
My complaint was that it leaked in a heavy rain. It was windy with gusts up to 20-30 MPH and the rain was coming sideways for most of the night. The side that bore the brunt of the wind almost collapsed. We had the rain fly tied off but it still leaked through and the water that came under the tent leaked through the bottom. Ventilation was fine with no condensation. This tent is the smartest tent out there with mesh walls, factory sealed fly and floor, #8 zippers two vestibules, and a door on each side. I'm back into scouting and this fits my style perfectly as it is extremely light and stands up to the harsh New England weather without failing! I highly recommend this 3-4 person tent to anyone who takes camping to the next level. This tent is super easy to set up even in low/dark light because of the one-pole framing. The fly is full coverage and has roomy vestibules for gear that needs to stay outside (boots!). It comes with extra sewn in loops for staking the fly more securely in rough and windy weather. I would purchase the footprint as it really makes a difference for moisture control and saving on floor wear against the ground (made too fit perfectly!). Best thing about this tent is the ample room and high ceiling (as far as tents go), and how easy it all goes together. I plan on using this tent for many years and even an occasional winter weekend out! Welcome to Trailspace, Steve. I hope you'll keep us posted on how your Chaos continues to perform. This is a well made and durable tent that is easy and quick to set up. The rain fly creates two dry vestibules to store gear allowing for more available room in the tent. 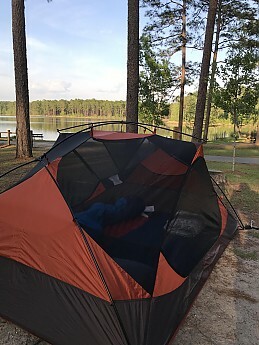 I purchased the tent from a discount site at a 20-30 percent discount, which made it a great value! I bought the tent about eight months ago and have used it for a total of about three weeks. I haven't used it for a backpacking tent, so I can't review it in that regard. However, if you just used the rainfly and footprint, you could create a shelter that is lightweight and takes up little space. This tent is very easy to set up. The first time I used the tent, I had to set it up at midnight using the car headlights to see. It only took about 10 minutes to set up. There are only two separate pole assemblies, one for the tent and one for the rainfly. I only use four tent stakes and the tent has remained stable and dry in storms with 30-40mph winds. Since the rainfly can clip directly to the optional footprint, it's possible to even take the tent down and put it away under shelter so it remains dry. 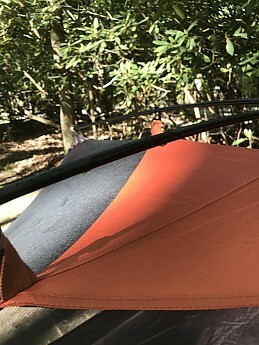 The tent has a full mesh roof which makes for great ventilation and so far I have not noticed any condensation issues, and have used the tent in temps down to 40°F. On cooler nights, you'll want to make sure that you position the tent so the doors are not facing into the wind. The vestibules created by the rainfly can create a wind tunnel effect and bring the cool air into the tent. When positioned perpendicular to the wind, the rainfly keeps the tent plenty warm for temps down to about freezing. Due to the amount of mesh on the tent, it's definitely a 3-season tent, but I'd feel comfortable using it for temps down to 32F. Even though I haven't used it for too long, I have been thoroughly impressed with the waterproofing, ease of setup,/tear down, and the overall construction of the tent. It looks like it will be a very durable tent that will last me for years to come. I definitely recommend it for use as a two person tent, but with three people, it would likely be a tight fit. Thanks for sharing your Alps tent review with us, Eric. I hope you'll keep us updated on how the Chaos continues to perform, and perhaps add some pictures of your tent setup. Overall a great tent that take a lot of abuse. Heavy for backpacking so split it up! I really didn't know what to expect since I didn't have any experience with ALPS products and the price was incredibly low. I was fully prepared to send it back but was so impressed with the quality and how easy it set up, I figured I had a great deal. On its first trip out, we had no choice but to pitch it on a ridgeline. Sustained winds of 30 mph with gusts to 50 mph, rain and hail, so I didn't sleep a wink waiting for a pole to snap or the fly to shred. Talk about bomb proof - it still looked brand new the next day. The hub and pole design make putting it up a piece of cake. Being able to set up the tent under the fly in the rain is a beautiful thing too! Being a bit claustrophobic, I bought this tent for 2 average sized adults. 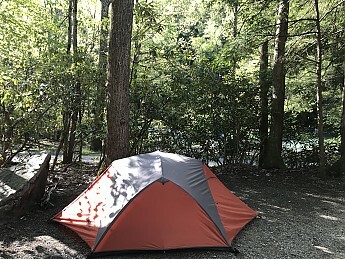 Way more space (and weight) than necessary so I've downsized for backpacking, but it's easily in the top 5 3-man tents I've come across for car camping or short haul base camping. Two doors and huge dual vestibules are a big bonus - one I miss with my smaller tent with its single door and vestibule. The only negative is the weight, especially if you're using it for 2 people on a long haul. It definitely helps to split it up but it's still more than most folks want to pack. Picked this up on sale at Amazon. Great quality tent. Picked this up on sale at Amazon. Great quality tent. Easy up / easy takedown and very light. Spent two nights in late October and slept two plus my dog comfortably. Didn't get to test it in the rain but was warm enough in 40 degree weather.